First, you should know that most carpets can be dried and salvaged after a water damage situation. Replacement is only necessary for certain types of water damage. Atlantic1 is on call 24 hours a day, 7 days a week for water damage emergencies. We put a priority on carpet drying due to water damage situations to prevent mold and mildew problems in your home. 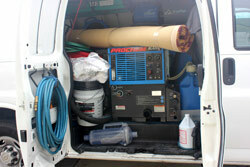 Do you have water in your carpet and padding in your home or business? Carpets absorb a lot of water and the padding beneath holds it all. A pipe burst, a tup, sink or toilet overflowing, or a flash storm can cause your carpet to become soaked and damaged. By doing the carpet drying as well as rug and padding drying, we can save your carpets and avoid permanent damage and the need for carpet replacement. The longer you wait to call the more damage is being done to your carpets and floors! Remember, some damage is invisible at first glance. You need a Professional to evaluate the situation and detect water damage. A lot of people will rent or buy a vacuum for water to dry the carpets & rugs themselves. However, depending on the amount of water that needs to be dried, you may need to hire a professional to properly dry the carpet and padding to prevent additional damage to your baseboards and floors. Sometimes it is necessary to remove the carpet and padding to properly dry the area. Water damage can cause mold and mildew to start forming on the damaged areas. There are many types of mold. About 100 types are known to cause infection in healthy people, while other molds cause infections only in persons with compromised immune systems. Most people tolerate exposure to moderate levels of many different molds without any apparent adverse health effects, while others may have severe allergic reactions to even the slightest amounts.